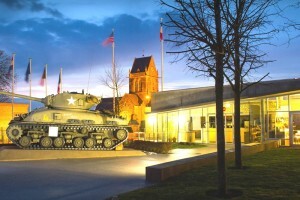 Sainte-Mere-Eglise, the first town of Cotentin in Normandy liberated by American paratroopers. 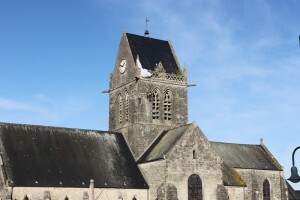 Sainte-Mere-Eglise and its surroundings are a strategic area along the national road connecting Cherbourg to Paris, at a junction between five departmental roads. On the night of 5th to 6th June 1944, the 82nd Airborne Division was experiencing difficulty in destroying the bridges on the river Douve and establishing a line of defence. The flooding of rivers was worse than expected. 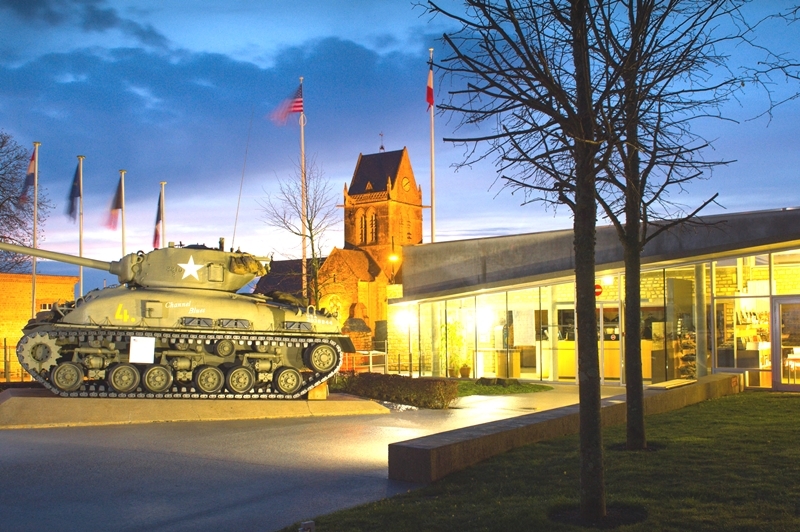 Sainte-Mere-Eglise was a key location in the line of defence along the road to Omaha Beach. 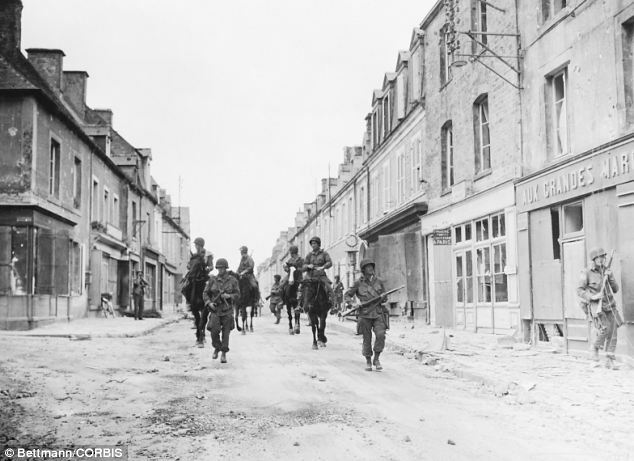 During the Normandy invasion, 30 paratroopers landed in the town of Sainte-Mère-Eglise , including 20 on the church square. German soldiers hurled into the attack and a battle raged on for two days. U.S. forces’ resistance was put to the test. The Allies were forced to defend many places simultaneously, including the bridges of la Fière and Chef-du-Pont. On 7th June at noon, reinforcement troops, who had landed on Utah Beach were there to clear Sainte-Mere-Eglise. Sainte-Mère-Eglise holds annual commemorations in tribute to the liberators, including John Steele, the celebrated paratrooper. These marks of gratitude are omnipresent in the town. Many plaques and monuments have been erected in honour of the liberators, such as the zero milestone opposite the Town Hall, which symbolises the starting point of the path to freedom. 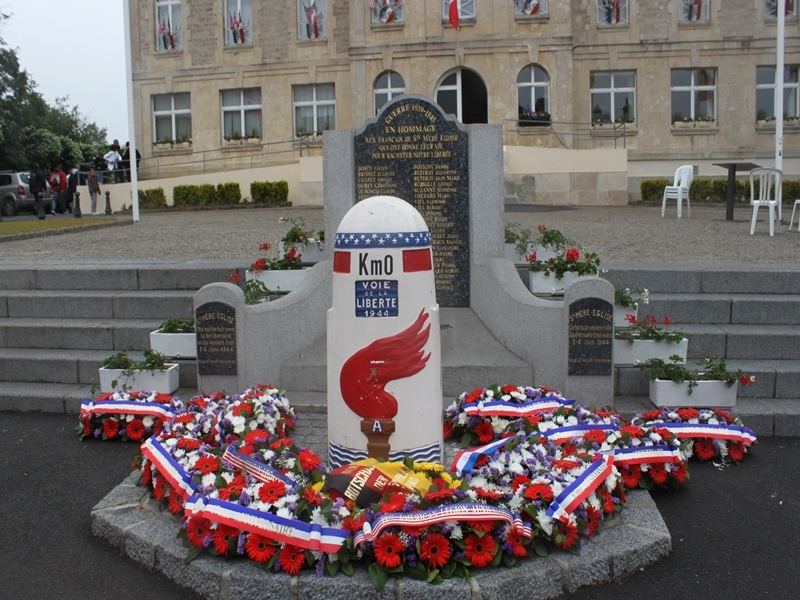 Every year, the town celebrates the anniversary of its liberation. In June, come and join in the celebrations for the Anniversary of the Normandy landings. Private John Steele of the 82nd Division was hit by shrapnel shortly after he began his descent. He could not use his leg and landed on the church tower around 4.00 am. Beneath him, the battle was raging. John Steele spent two and a half hours hanging from the church steeple. After trying to cut free with a knife, he dropped his gun and decided to play dead to avoid becoming a target of the Germans. He was finally cut free by a soldier named Rudolf May. His wounds were treated and he was taken prisoner by the Germans. John Steele managed to escape three days later. He rejoined the Allies and was transferred to a hospital in England. John Steele later participated in the liberation of the Netherlands, at the Battle of the Bulge near Reims, and arrived in the area of Frankfurt (Germany) at the end the Second World War. He was then reassigned to the 17th Airborne Division and sailed from Marseilles to return to the United States and finally resumed a normal life in September 1945. 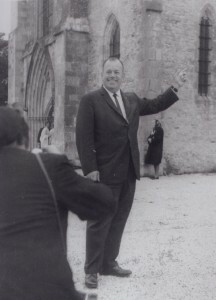 John returned several times to Sainte-Mere-Eglise, to attend commemorations of the 1944 Allied landings. He died of throat cancer in 1969 at the age of 57, in his small town in North Carolina and expressed the wish to be buried in Normandy… this unfortunately did not happen. “Airborne Museum” come and see and exclusive collection of historic item, a glider and a C-47 plane. The museum will let you enter D-Day landing with 82nd 101st American paratroopers.